problem-solving through engineering design challenges and the use of technology. Teachers in the program facilitate learning in an environment that develops imagination and critical thinking. The program is comprised of two classes of 6th-grade students who share three periods together each day. The 6th-grade program is designed to provide students with a rigorous math and science curriculum, as well as assist students in developing high-level study skills for future academic progress and success. 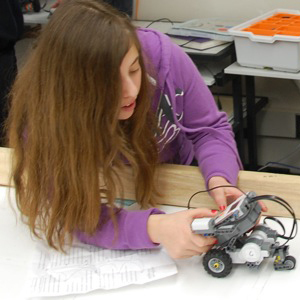 The two period JAMS program offers 7th graders the opportunity to take a greater variety of elective classes such as Spanish, robotics, music, shop, and physical education. The two period block provides the flexibility to integrate and provide hands on learning and the opportunity to spend both periods in math or science for a greater depth of subject matter. What curriculum topics will be covered in each grade? The 6th-grade JAMS class will focus on an integrated approach to science by providing an introduction to energy and studying areas like the scientific process, earth history, diversity of life, and catastrophic geologic events. Math topics will include: equations, rates and ratios, probability, rational numbers, and three dimensional figures. In the 7th grade, students will focus more on earth and life science which include chemical interactions, energy, populations and ecosystems, catastrophic climatic events, and planetary science. Math topics will include: linear equations and functions, surface area and volume, proportions, and geometric figures. In order for students to move on the 8th grade JAMS program, they must meet the district qualifications for Algebra based on their MAP/MSP scores. These 8th grade students will complete high school physical science including force and motion and will also complete high school algebra. A student completing the 8th grade JAMS program will finish with one credit of high school math and one credit of high school science. Recommendations for student success in the JAMS program. Students who will be successful in the JAMS program should have strong work habits and study skills. They should have MSP scores for Reading, Writing, Math and Science at a high level three or a level four. In addition, students should have MAP scores for Reading and Math above the 85th percentile. When can I apply for the JAMS program? Students are selected into the program via a lottery system. For more information regarding JAMS, please contact Principal Michael Cimino at (360) 596-3200. You can also find additional information on the Jefferson Middle School website.